Berlin is a picturesque New England town of about 2600 people. Its idyllic rural feel belies its convenient location near the intersection of routes 495 and 290, just 45 minutes from Boston and 20 minutes from Worcester. Berlin is nestled in in a low range of hills between the Nashua and the Assabet River Valleys, and boasts excellent schools and easy access to shopping, dining and entertainment. Incorporated in 1812, the town has a rich history of agriculture, manufacturing and lumber. Sawyer Hill EcoVillage is located at 46 Sawyer Hill Road. 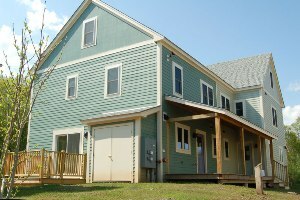 Sawyer Hill EcoVillage was developed under the Massachusetts "40B" affordable housing law. Seventeen of our 68 homes are set aside for income-qualified buyers through a state-regulated system.